Whether you’re a festival virgin or a veteran of the festival scene, trying to figure out what to wear to a festival isn’t something to be taken lightly. 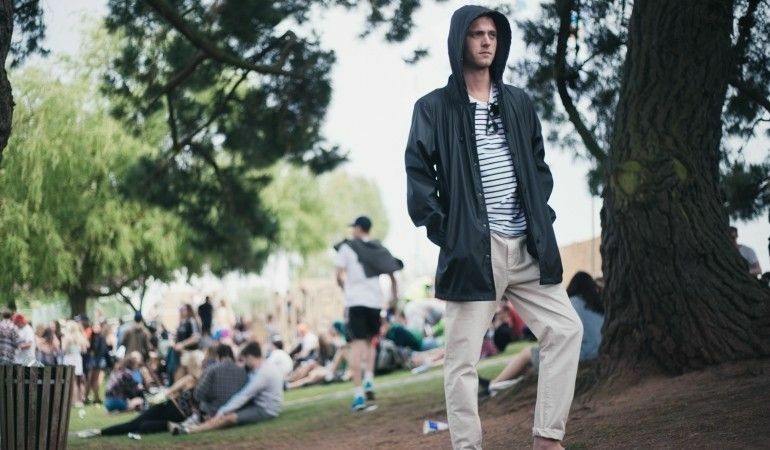 Whilst on the search for the coolest, trendiest men’s festival clothing, we don’t always account for practicality before we venture into the wild, wonderful world of unpredictable weather and raucous revellers. A festival outfit has to be protective, comfortable, and inexpensive, all well as something that makes you stand out in a crowd for all the right reasons. Finding that perfect head to toe festival outfit is the first step to a fun weekend without any hitches. ‘Whenever not?’ is the real question. T-shirts are peak men’s festival clothing always. The best thing about t-shirts is that they never go out of style; one- toned T’s, faded pattern or oversized, you know that you’ll get a combination of chic and comfort, particularly whilst dancing about in the middle of summer in a field somewhere. Slogans and simple patterns are great for making statements. They can even form icebreakers, allowing observers a casual glance at your personality before deciding whether you’re worth getting to know. Plain light colours have some obvious drawbacks – one of the most obvious being that they’re unlikely to still be ‘plain’ after more than an hour with all the muck that is going about. But they’re reliable, and when complemented with a cheeky bit of boho jewellery like a subtle silver necklace, it’s more than enough. When it’s hot out and you want to show off a little hamburger meat in style. Trust us – the Magnum P.I. look is in for men’s festival clothing. You probably thought that short-sleeved summery prints only worked on a picturesque beach in a foreign land but they’ve also found a home on the commandeered grasslands of the British Isles. These visually-striking shirts marry lightweight materials with bright graphics that would be garish in any other situation. Still, they’re a way of telling those who see you that you are definitely in holiday party mode. Moreover, button shirts offer the freedom of loosening up further in unbearable heat. Unlike figuring out what to wear to a festival, there are stricter guidelines with undoing buttons: only undo one of two max if you plan on leaving a little still to the imagination, or go full hard rave festival style and undo them all. 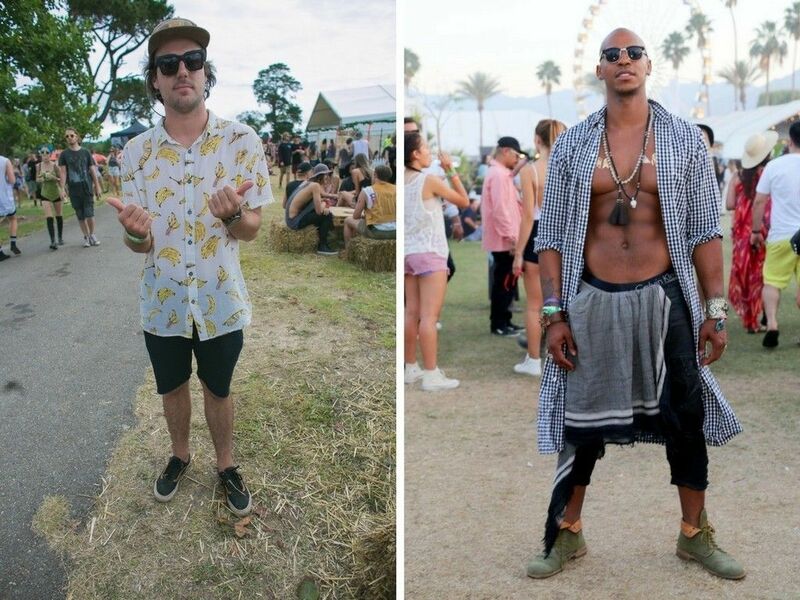 When searching for what to wear at a festival, plan for all possible changes in weather. Hard rain just seems to be unpreventably festivals, no matter how dry it’s been previously. Festival raincoats don’t mean expensive designer parkas – it can be as simple as a showerproof festival poncho that cost more than a fiver everywhere. Ideally festival raincoats will keep you dry without adding a big, thick, noticeable layer on, so something that is feathery light, durable and cool like a soft-coloured rain mac or a simple cagoule does the job effectively and inexpensively. 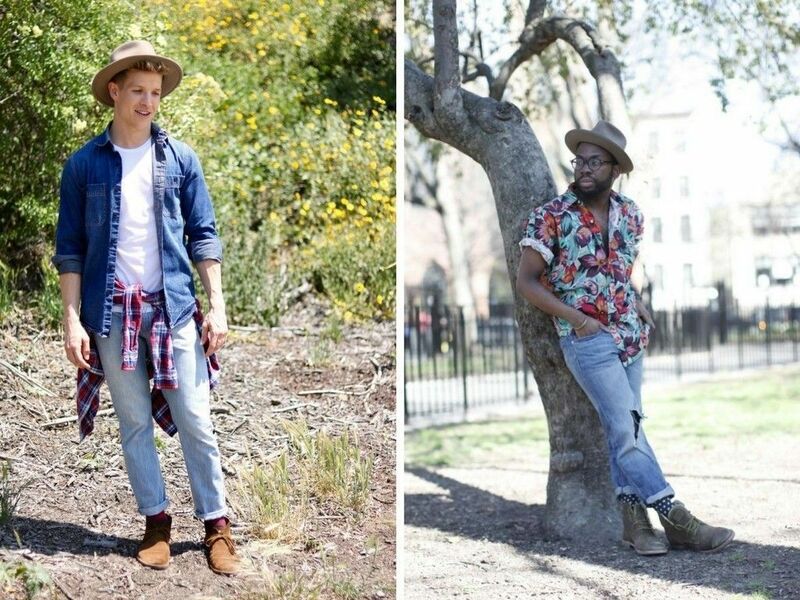 Denim’s back in a big way (not that it ever left though). The washes are getting lighter and lighter and the amount of material being used is becoming less and less as the young generation crave extreme shreds. While it does seem a bit of a shame to walk around in what is, essentially, ruined jeans, ripped and distress jeans bend and stretch in a way that many traditional jeans can’t, not to mention how attention-grabbing they are. That’s always a good thing when trying to figure out what to wear to a festival. Alternatively, you can go a bit more conservatively with some nice loose fits. Tailor them with roll ups to show off your fancy new wellies. Loose fits, like ripped jeans, are roomier than skinnies allowing for a little more freedom on a long weekend on your feet. 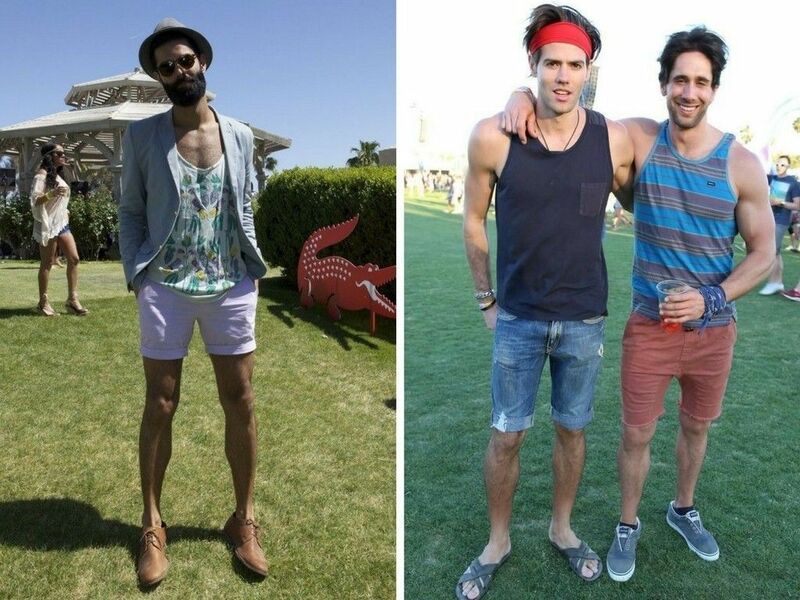 I know what you’re probably thinking: “since when did trunks become a part of men’s festival clothing”. But we can see the functionality in utilising the breathable, quick-drying material, as well as the mid-thigh length in tough heat. They come in a number of colours and designs to accompany any festival outfit ideas you may be imagining. Not to mention they have a unique way of emphasising leg musculature. Very flattering gear. Boots and expensive footwear with hard soles are a torture chamber for your feet when it comes to men’s festival clothing. 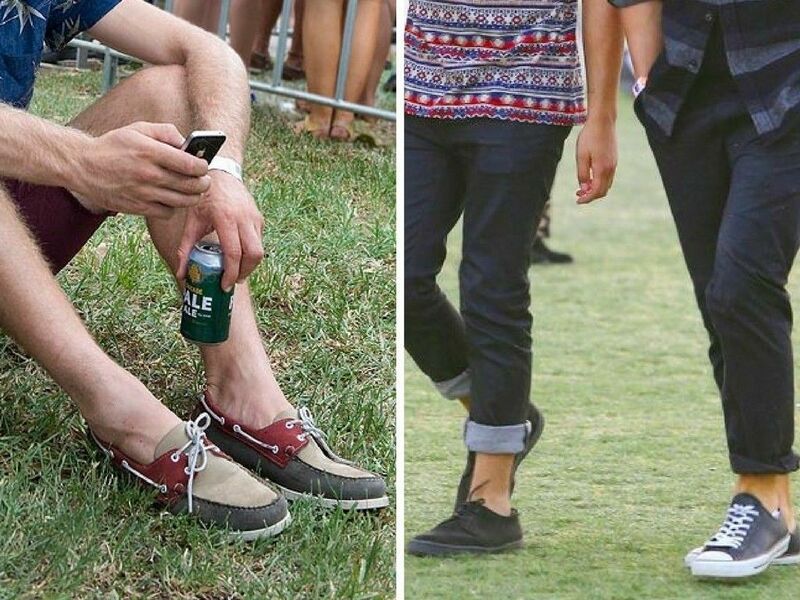 Festival footwear needs to be spacious and versatile for different weather. Trainers and plimsolls may not protect your toes from the odd stub in a crowded stage, but they at least ensure that you’re able to keep on your feet longer throughout the weekend. Wear, or purchase, a cheap pair that are just to get the job done. Chances are they’ll get trodden on and attract dirt like a vacuum, so unless you hope to be mourning the destruction of your favourite kicks, don’t take them. Also, with this in mind, choosing darker colours that make dirt less visible will at least give you some peace of mind that you’re not being completely caked in mud, grass, scuffs and beer. When it’s fish weather and the turf underneath seems desperate to swallow you whole. An absolute must at every festival, no matter the weather. Wellies are iconic festival attire for both men and women, because of this brands have gone to some lengths to provide more fashionable options. 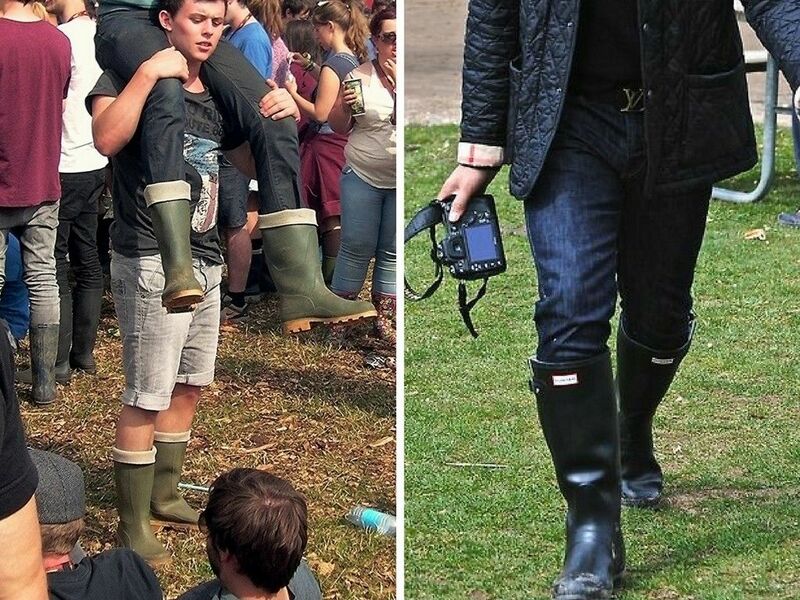 The practicality of the mac, jeans and wellies look has become so common that it’s a festival fad. Try to find some wellies that protect your feet but still add something to your festival outfits ideas. Hats can often end up being the centrepiece to men’s festival clothing. Typically baseball caps are the most popular with their pragmatism and simplicity proving timelessly en vogue. But trucker hats and, most notably, fedoras are offering a fresher alternative to the monotony. Now, better than ever before, you can look a cool as you feel. Sunglasses: for when a hat that Indiana Jones famously wears just isn’t awesome enough. This is practically an essential style item for any men’s festival clothing ensemble, but what are the right pair of sunglasses? You can either go with the mirror lenses, which everybody seems to be wearing nowadays, or some bright-rimmed wayfarers for that classic look. As you probably are aware if you’ve browsed through our site, we love a good backpack. Turns out, so do many festival goers, but they really are a major hassle at a festival. Backpacks get in people’s way and are easy for thieves to target as you jump about in a confined space full of complete strangers. Bum bags, though not as hip (see what we did there?) as backpacks definitely provide better security for your cherished belongings, like your phone, debit card and ID. You can clip it around your waist or even wrap it diagonally across your body.